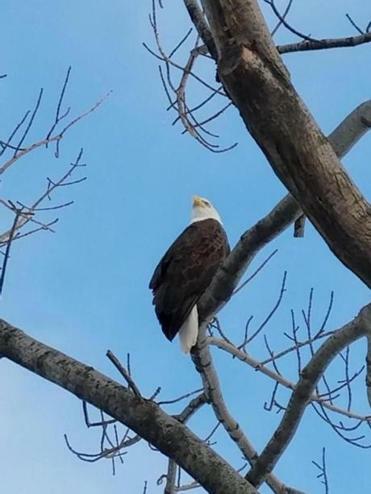 An Esplanade Association employee spotted a bald eagle flying over the Charles River Esplanade last Friday. A bald eagle has been sighted again on the Charles River in Boston. The eagle was spotted flying near the Esplanade on Jan. 12, the Esplanade Association said in a statement. An association staff member saw the eagle and took its picture. “I was so excited that I immediately stopped our work vehicle to get out and take a photo,” Renee Portanova, horticulture manager at the association, said in the statement. The eagle perched on a tree near the upper part of the Esplanade, close to Silber Way and Boston University’s campus, said a spokeswoman for the nonprofit, which sustains the Charles River Esplanade. It’s not the first time a bald eagle has been sighted along the Charles in recent years. Other sightings include one in 2016 and one in 2010. “I hope many more visitors to the Esplanade in the coming weeks will have the privilege to see this majestic bird,”said Michael Nichols, executive director at the Esplanade Association. Bald eagles suffered a catastrophic decline in the 1950s and 1960s due to the use of the pesticide DDT, which led the birds to lay eggs with soft shells or no shells, according to MassAudubon. The species was reintroduced in Massachusetts at the Quabbin Reservoir in 1982. The first nest in the wild with eaglets was reported in 1989. As numbers grew, the winged predators’ status here was changed from “endangered” to “threatened” in 2012. Steve Annear of the Globe staff contributed to this report. Elise Takahama can be reached at elise.takahama@globe.com. Follow her on Twitter @elisetakahama.